How High Will Gold Go? 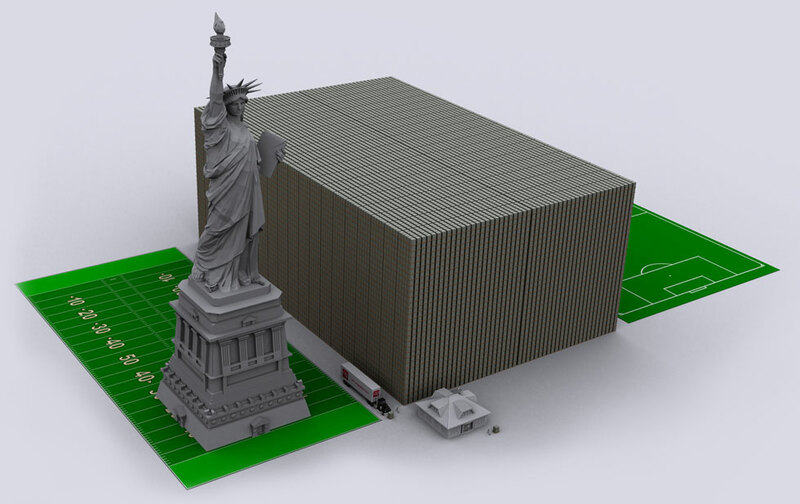 That’s $15 trillion — the size of the US debt — stacked up in $100 bills. How the hell did it get this way? A helicopter drop of money. Bernanke’s view is informed by his view of money. His career as an academic economist was defined by his theory that deflation fuelled and worsened the Great Depression. The collapse of banks, he believes, led to a severe drop in the supply of money, which led to a severe drop in economic activity as individuals and businesses assumed that more deflation would occur, raising the expected future value of the money they were holding, preventing them from spending it, and preventing further productivity from taking place. And this may well all be true. The problem is that printing money allows governments and societies to carry on in the face of problems without ever really addressing the underlying causes — loss of productivity, bubbles, poor infrastructure, expensive wars and empires. And of course, those problems will rear their ugly head again, unless they are properly addressed. Gold flashed past $1800 an ounce today. But it has not gained any value: it is America and the West that has lost it. The real question is not how high gold will go, but how low America and the dollar will. This entry was posted in What is Money? and tagged bernanke, gold, hyperinflation, money. Bookmark the permalink. By the way, in case you want a figure, I’d say $10,000 an ounce is a conservative estimate. I’ll give you my thoughts in full on silver in a post tomorrow. Essentially: the fundamentals are somewhat different, because of the industrial demand factor. Basically, silver is becoming more scarce than gold because of industrial demand. This makes silver more valuable but also less valuable because it is less suitable as money (because the supply is less stable). I see silver over $300 an ounce on industrial demand. I would still take gold over silver, because of gold’s future as money. A rolling stone is worth two in the bush, tnhkas to this article. I do my analysis a little differently, but I basically agree with FOFOA’s inverse waterfall view on price. Azizonomics, i don’t want to sound derogatory. but this financial stuff. leave it with the experts like Marc Faber, Jim Rogers, Robert Kiyosaki, Bix Weir, Peter schiff or certain blogs to name a few. I am a independant reader but i definatly see you using other peoples hard work. if you quote please report your sources. it definatly debunks your own reputation in my opinion. I’m just using my own thoughts. I have been reading material on gold for years, and I’ve internalized it, done my own analysis and reached my own conclusions, and made financial decisions based on my own conclusions — way back, at less than $1,000 an ounce, and less than $10 an ounce for silver. I know there are guys in the market who bought at $35, but I’m not that old. Why do my independent thoughts agree with Jim Rogers? Because mostly, when you lay out the facts and use logic and reason you come to some variation on this conclusion. When I use someone else’s thoughts I quote them. Just last week I quoted Marc Faber on a related matter. I wrote an entire book (45,000 words) last year exposing my thoughts on the international financial paradigm, and the future of the human species. This blog mainly takes from my fully-researched, fully-cited and data-focused book, not the opinions of any other commentator. Please don’t accuse me of plagiarism. At the core of the expert problem is that people are suckers for charlatans who provide positive advice (what to do), instead of negative advice (what not to do), (tell them how to get rich, become thin in 42 days, be transformed into a better lover in ten steps, reach happiness, make new influential friends), particularly when the charlatan is invested with some institutional authority & the typical garb of the expert (say, tenured professorship). This is why my advice against measuring small probabilities fell on deaf ears: I was telling them to avoid Value-at-Risk and the incomputable rare event and they wanted ANOTHER measure, the idiots, as if there was one. Yet I keep seeing from the history of religions that survival and stability of belief systems correlates with the amount of negative advice and interdicts — the ten commandments are almost all negative; the same with Islam. Do we need religions for the stickiness of the interdicts? So instead of saying buy gold, I think it is safer to say don’t buy dollars. Plagiarism is only Plagiarism when you one. Or deliberately copy but jumble to hide the fact you are plagiarising. We all have the knowledge of thousands of years of our forefathers. Aziz, you like I are well read, and we digest and ponder the thoughts of others. Strokes of genius are another matter. But when I get an idea in my mind. I google it and find that someone else has had that thought. It is as if we all have ancient memories buried deep. Those who internalise can reach back into our “instinct”. Your comment DOES sound derogatory. ANYONE with a brain can do financial analysis. It’s not some “divine science” that only the gods can master. Your comment is an example of the problem with people today. They want everyone to “leave it to the experts”. “Leaving it to the experts” is exactly the response that has driven us down the road to multiple QE injections. Now I’m not accusing marcuz of advocating endless QE, not at all. He just thinks I should defer to Marc Faber. Faber is a great guy, but if I can’t make my own decisions based on the evidence, how can I invest in anything? The “expertise” route is full of false prophets and charlatans — after all Bernanke was a tenured professor, with a hell of a lot of citations in published literature (slightly less than Krugman and Sitglitz) — for a damn long time. If there’s one thing we need more of in society it’s independent critical thinking. How can we have capitalism if the common man or woman cannot think independently about finance? What I want to see is more people getting involved in finance, so more people can become small-to-medium-scale capitalists, and give our society more of an investment culture. I think youre still doing a good job, and not acusing you of plagiarism. only i do see alot of similarities in pieces of text, GFX and quotes. It might even enhance your blog if you incorporate them more explicitly. Maybe i was a little bit blunt, anyways keep up your good job. i’m enjoying what i’m reading. You put the straw in the coconut and drink the article up. I generally get my graphics from google images, afp and reuters so yes, I am sure they are largely the same. I know this is not really very professional, but I am a one-man operation with no Bloomberg Terminal and no camera crew or graphics editor. In this specific article I really did only quote Keynes and Bernanke. The rest was purely me. Again, maybe I have internalized the views of others, but that’s the way all knowledge is transmitted and learned. Check back tomorrow for my view on silver. I promise I will not sound anything at all like the Silver Bears, or mention Blythe Masters, COMEX hikes or paper shorts. Just fundamental analysis. The Lawnmower says silver wont follow until gold cools off. Right now on Comex and the London Exchange the traders are going to play in the market where there is the most volatility and where they can make the most money. That market is gold. Once gold is neutered by multiple margin hikes it will be Silver’s turn to shine. In the meantime I will go with my gut and short gold at $1800. I may get flattened by the steamroller that gold is right now but I like my chances. I I do this for a living. Buy Silver anytime the silver to gold ratio is 45+-1. But gold when the ratio is 38/40-1. That will be all. I basically agree with you. Gold is a hedge against everything, including and especially non-growth. Silver is an industrial metal, and its demand (and price) follows global manufacturing and industrial demand. The fundamentals are different. Still, as an industrial metal, I think silver is terribly undervalued and — on global demand for iPhones and missiles, etc silver will keep rising in the medium to long term. In the short term I expect gold to outperform, with silver static to lower on lower industrial demand. Long term price target for silver still 1:3 against Palladium. The Lawnmower also forgot to inform you about the ATM bank machine called palladium. I will stuff my clients into palladium in the low 700’s and ride that pony up to 800’s which will usually take 3 weeks. Put stops after 800 because when it tanks it tanks fast. What took 3 weeks to rise 100-130 dollars/oz will come down by $100+ dollars in 4-6 days. Then you ride the ATM palladium pony up again. 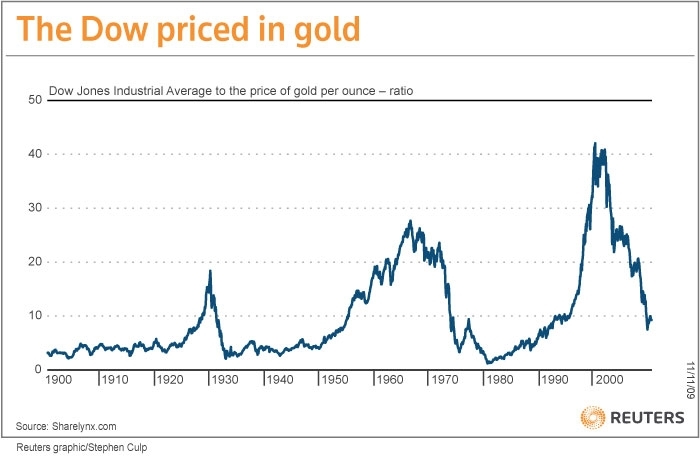 Why is that a falling gold price implies progress?